Visiting Canada on a Snake River / Peel River canoeing trip with a dear friend of mine, CK73. We arrived in Whitehorse, YT, late in the evening of July 20th after a long trip from Helsinki (where we both live) via Stockholm-Arlanda, Munich and Vancouver. We spent the following few days in Whitehorse and explored the area (loved the S.S. Klondike!) before meeting the other participants of the trip in the evening of Sunday, July 22th. The following morning we packed our gear in the trailer of a minibus, which took us to Mayo. From there we flew to Duo Lake, where I found the most remote geocache I have found so far, GC5C7DJ "Duo View-O". After that I had the longest break I have had from geocaching for several years as we started our canoeing trip towards Fort McPherson. The trip was the best holiday I have ever had: I really enjoyed the river and the surrounding nature. In the early morning hours of August 9th we finally reached the ferry landing near Fort McPherson and spent the 2nd to last night of the trip in tents. In the morning we went after GC58N07 "Nitainlaii Park", my first find in more than two weeks, before starting our trip down the Dempster Highway towards Dawson City. Our driver was kind enough for a brief stop at the YK-NWT border so that I could find GCXFAM "YK-NWT Border Tag Exchange". This was our next stop: we had a lunch break and I went after GC8A0A "The Arctic Circle", which I also found. 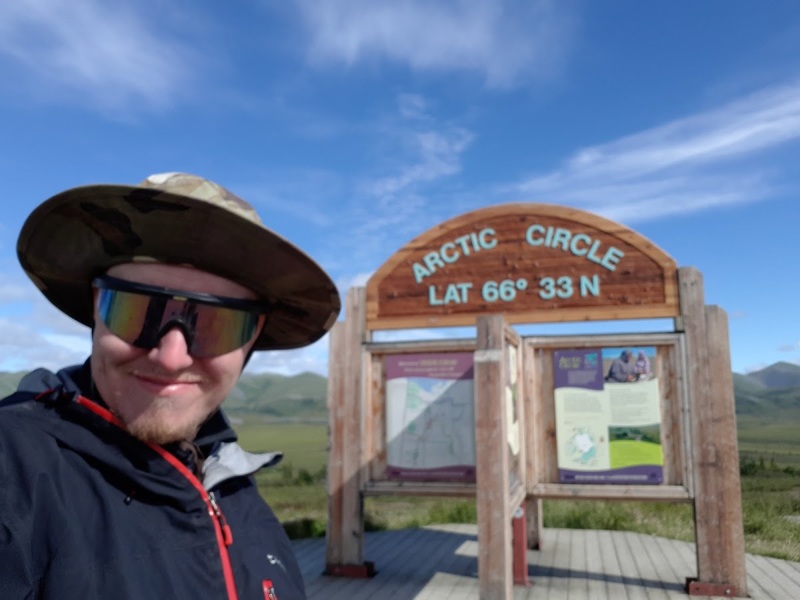 In addition to taking lots of photos of the scenery, I was fortunate enough to take a selfie in front of the sign, which I am using now to log this virtual cache. After having our lunch we continued south and had another break at the Eagle Plains Hotel where I learnt a lot about The Mad Trapper. After that our next stop was at the Ogilvie Ridge viewpoint, which had wonderful views and where I published an earthcache, GC7WWYB "Ogilvie Ridge" (which only has an FBA log so far!). Then we continued to the Engineer Creek Campground, where we spent the following night, our final night of the trip spent in tents. The following morning we headed first to Tombstone, where we had our lunch and visited the Tombstone Visitor's Center. Then we drove on to Dawson City, where we were able to have our first proper shower in almost three weeks. It felt like a luxury! After changing to nice, clean clothes we had a dinner and then it was time to go after some more caches in Dawson City before sleeping the first night in almost three weeks in a comfortable, soft and warm bed instead of a cold and moist tent. After a very well slept night we continued back to Whitehorse, even though we had some bad luck on the way in the form a flat tire. After finally reaching Whitehorse we went for a farewell dinner with our canoeing group and then in the following morning started our long trip back home by flying first to Vancouver, next to Frankfurt, then to Stockholm-Arlanda and finally to Helsinki. 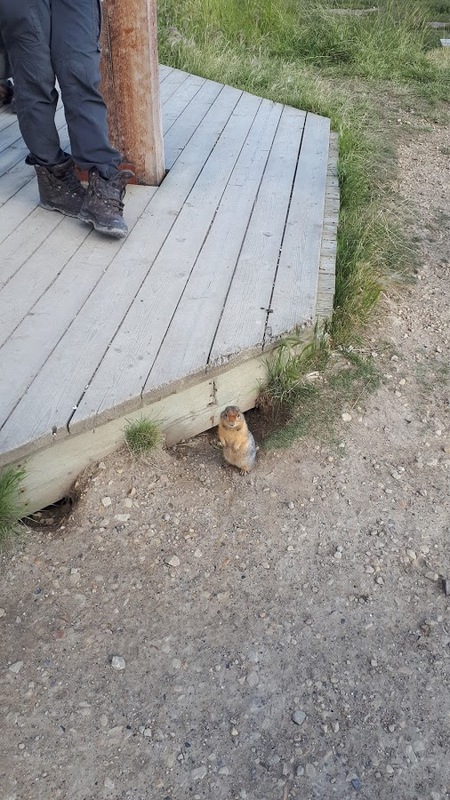 This was the best and most memorable holiday I have ever had, and I hope I can return to Yukon in the summer of 2020 for more canoeing and geocaching. Many thanks for this virtual cache! NH82 @ OU0A98 "Welcome to the Arctic Circle"